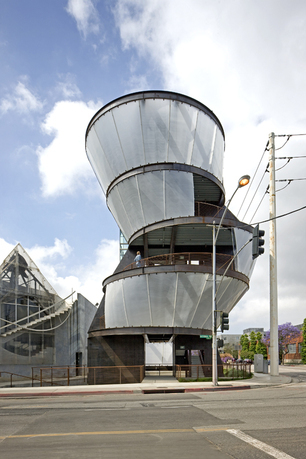 Eric Owen Moss Architects, Samitaur Tower, Culver City, California, 2008–10. Copyright: Tom Bonner. A New Sculpturalism: Contemporary Architecture from Southern California marks the first exhibition and catalogue to examine the role of Los Angeles–based architect Frank Gehry, arguably the most significant and innovative architect of the later part of the twentieth century, and the generation of Los Angeles architects that followed him, including Greg Lynn, Michael Maltzan, Thom Mayne, and Eric Owen Moss, to name a few. A New Sculpturalism focuses on this important era in American architecture and presents the first extensive examination of the built forms that characterize Southern California architecture after 1990, as well as the geographic, political, and socio–economic underpinnings of its development. The exhibition includes both large, full–scale new structures, made specifically for the show, and models, sketches, and digital presentations, which illuminate their significant achievements. Christopher Mount, guest curator of A New Sculpturalism, is an independent curator, writer, and educator specializing in twentieth- and twenty-first century architecture, design, and graphics. He is currently an adjunct curator at the Museum of Contemporary Art, Los Angeles. Before moving to Los Angeles to become executive director of the Pasadena Museum of California Art, Mount was director of exhibitions and public programs at Parsons, the New School for Design. He had also been editor-in-chief of I.D. Magazine and was a curator in the Department of Architecture and Design at the Museum of Modern Art for fourteen years. He has also been a professor of art, architecture, and design history and theory at Cal Arts, the Otis College of Art and Design, the Cooper-Hewitt Museum and Parsons' master's program, and the Bard Graduate Center for Decorative Arts. A New Sculpturalism: Contemporary Architecture from Southern California is accompanied by a fully illustrated catalogue, copublished by Rizzoli, featuring a wide range of critical voices on this significant period of architecture in Southern California. In addition to an essay by the curator, the publication includes contributions from University of California, Berkeley professor Margaret Crawford; Los Angeles–based freelance journalist, editor, and photographer Sam Lubell; architectural historian, writer and curator Nicholas Olsberg; and the show’s curatorial research assistant Johanna Vandemoortele. The publication also features an extensive bibliography and charts depicting the overlapping academic and professional influences on the architects of this period compiled for the exhibition. Frank O. Gehry (Gehry Partners), born in Toronto in 1929, is one of the most significant and influential architects alive today. In 1962, Gehry established his practice in Los Angeles, California, and has designed several world-famous buildings such as the Guggenheim Museum in Bilbao and the Walt Disney Concert Hall in Los Angeles. In 1989, Gehry was awarded the Pritzker Architecture Prize for his pioneering work and vision for architecture and the built environment. Gehry is widely published and has received countless awards and recognitions. In 2005, Sydney Pollack directed a documentary on his life and work, Sketches of Frank Gehry. Franklin D. Israel, born in 1945, was an innovative architect based in Los Angeles, California. Having grown up on the east coast, Israel relocated to Los Angeles in 1979 to teach at University of California, Los Angeles. After spending years working for the entertainment industry as a set designer, he founded his own firm in 1983 and built a successful career as an architect to private clients and film production companies in Los Angeles. Franklin D. Israel passed away in 1996, the same year a retrospective exhibition of his works was held at the Museum of Contemporary Art in Los Angeles. 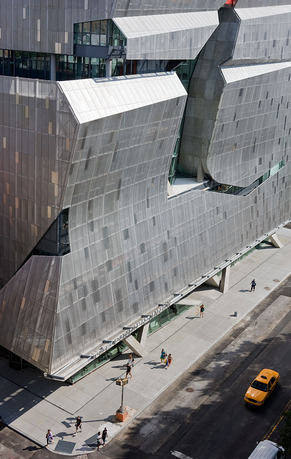 Thom Mayne, born in 1944, founded Morphosis Architects in 1972, an interdisciplinary practice involved in design and research that yields ground-breaking, iconic buildings and urban environments. He is a founding faculty member of the Southern California Institute of Architecture (SCI-Arc) and a distinguished professor at University of California, Los Angeles’s School of Architecture and Urban Design. With his firm, Mayne was awarded the Pritzker Architecture Prize in 2005. He and Morphosis are widely published and have been the subject of several exhibitions, interviews, and twenty-five monographs. He has received 26 Progressive Architecture Awards and over 100 American Institute of Architecture Awards. Michael Rotondi is the principal at RoTo Architects, based in Los Angeles. He is recognized as a pioneering architect and educator. Rotondi was a founding partner of Morphosis (1975–91) and founded his own practice in 1992. He was cofounder of SCI-Arc, where he was director from 1987 to 1997. Rotondi has received numerous awards for his teaching and design, which include the American Academy of Arts and Letters Prize for Architecture in 1992. Eric Owen Moss was born in Los Angeles in 1943, and founded his firm, Eric Owen Moss Architects, in 1973. He has held teaching positions at many universities including Harvard University, Yale University, Columbia University, University of Applied Arts in Vienna, and the Royal Academy in Copenhagen. Moss currently serves as the director of SCI-Arc, where he taught since 1974. Moss was awarded the Academy Award in Architecture from the American Academy of Arts and Letters in 1999, and received the AIA/LA Gold Medal in 2001. In 2006, he was honored as the 2006 AIA/LA Educator of the Year, and in 2011, he was awarded the Jencks Award by RIBA. Arshia Mahmoodi received his master's degree in architecture and urban design from University of Shahid Beheshti in Tehran in 1997. Before founding his own firm, VOID, in Los Angeles in 2006, Mahmoodi formed blu_under with partner Kevin Mulcahy in 2001, and in 2003, launched null.lab, an architectural design, research, and implementation firm, with Reza Bagherzadeh. Mahmoodi is the recipient of the American Institute of Architects Award for his Design of the Bobco Metals Company. His work has been published in the United States, Iran, Italy, Dubai, South Korea, and Japan. He has also lectured at California Polytechnic State University and been a guest critic at SCI-Arc, CalPoly Pomona, University of Southern California, Woodbury University, and the Los Angeles Institute of Architecture and Design. Coy Howard is principal of Coy Howard & Company, founded in 1973. His work has been published widely, and his awards include Progressive Architecture (PA) citations, 1977 and 1980; an Architectural Record House, 1988; and the Woodworkers Institute of America Award, 1986. In 1995, Coy Howard: Enough About Me was published and included his Palevsky Residence and Ashley Residence, as well as designs for furniture, some of which are included in the permanent collections of the Metropolitan Museum of Art, New York; Museum of Fine Arts, Boston; and Denver Art Museum. Howard holds architecture degrees from University of Texas and University of California, Los Angeles. He has directed the Environmental Arts Program at Otis College of Art and Design and the undergraduate program at SCI-Arc, where he is currently a faculty member. Craig Hodgetts and Hsinming Fung established Hodgetts + Fung in 1984. Best known for their groundbreaking 1992 library at University of California, Los Angeles and the reborn Hollywood Bowl, the studio has been responsible for the design of numerous landmark structures, including the UCLA Gateway, the Egyptian Theater, and signature pavilions at Art Center College and California Institute of the Arts. Hodgetts is a longtime professor at University of California, Los Angeles and founding dean at the California Institute of the Arts. Fung is director of academic affairs at the SCI-Arc in Los Angeles. Randall Stout founded Randall Stout Architects in Los Angeles, California, in 1996. Stout's projects have received numerous design and sustainability awards and honors. In 2003, the Steinhüde Sea Recreational Facility in Germany received the American Institute of Architects' Top Ten Green Award. Other honors include numerous awards from regional American Institute of Architects chapters and two American Architecture Awards presented by the Chicago Athenaeum. The Taubman Museum was awarded an American Architecture Award in 2007. Stout was elevated to the AIA College of Fellows in 2003. Founded in 1969, Studio Works Architects is a partnership firm based in California. Robert Mangurian continues as a founding principal; he was joined by Mary-Ann Ray in 1987. Both Mangurian and Ray are senior professors at SCI-Arc. Their projects have been awarded honors by the federal government, the New York City Bard Award Program, and the Progressive Architecture's Design Award Program. In addition, these projects have been widely published in journals including LOTUS International, Domus, Progressive Architecture, Architecture Magazine, Day Care and Early Education, American School and University Facilities, Look Magazine, Life, the New York Times, and the Los Angeles Times, among others. Barbara Bestor founded Barbara Bestor Architecture in 1995, an award-winning firm known for commercial projects and experimental houses in Southern California and New York. She graduated with a Master of Architecture from SCI-Arc, and obtained a degree in visual and environmental studies from Harvard University. Bestor has taught at SCI-Arc, Harvard University, and University of California, Los Angeles, and is currently the Julius Shulman Distinguished Professor in Practice at Woodbury University. She is also the author of Bohemian Modern: Living in Silverlake, a book dedicated to the suppressed narrative of informal and eccentric modernism found in Silverlake's rich domestic architectural history. 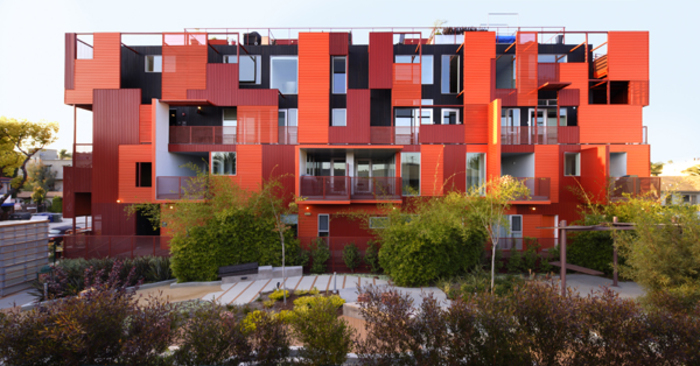 Santa Monica based Daly Genik Architects was founded in 1990, with a focus on residential- and community-based projects. Principal Kevin Daly had previously worked with Hodgetts + Fung and Frank O. Gehry Associates, and is currently a faculty member at SCI-Arc. The firm has been awarded several awards and recognitions, and their work has been published widely, including in the New York Times, Dwell, Architectural Record, the Los Angeles Times, Azure, and others. Lorcan O'Herlihy founded Lorcan O’Herlihy Architects in 1990, seeking opportunities to engage the ever-changing complexities of the urban landscape and embracing the role of architecture as a catalyst of change. O'Herlihy has earned over sixty international, national, and local design awards, including the 2010 AIA/Los Angeles Firm of the Year Award. In 2004, the Architectural League of New York selected O'Herlihy as one of the eight "Emerging Voices" in the United States. O'Herlihy has taught and lectured at the AA, SCI-Arc, Cranbrook Academy of Art, Columbia University, and University of Southern California. Mark Mack founded Mark Mack Architects in 1985, now based in Venice, California. A University of California, Los Angeles faculty member since 1993, Mack was previously a professor of architecture at University of California, Berkeley. His interests lie in housing as an architectural discipline and he has completed highly published projects in Fukouka, Japan, and Judenburg, Austria, among many others in California. His monograph Mark Mack: A Californian Architect was published in 1994; he is also the author of Stremmel House, published by the Monacelli Press. Major exhibitions of his work have been shown at the San Francisco Museum of Modern Art (1993) and at the Museum of Applied Art in Vienna (1994). Michael Maltzan founded Michael Maltzan Architecture in 1995 as a practice which engages the “increasingly complex reality of urbanization and information driven culture” and helps to define architecture's role and responsibility within the public sphere. Maltzan has been awarded several honors including five Progressive Architecture awards, twenty-two citations from the American Institute of Architects, and the Rudy Bruner Foundation's Gold Medal for Urban Excellence. He has lectured worldwide and has served as a design instructor, lecturer, and critic at the Architectural League of New York; the Rhode Island School of Design; University of California, Los Angeles; University of California, Berkeley; University of Southern California; Harvard University; University of Waterloo; and SCI-Arc. After working in New York for five years, Neil Denari moved his practice to Los Angeles in 1988, which was later to become Neil M. Denari Architects in 1998. Denari is a tenured professor at University of California, Los Angeles s School of Architecture and Urban Design and has also taught at Columbia University; the Bartlett; University of California, Berkeley; and Princeton University. He also teaches and lectures regularly in Japan. In 2008, Denari received an Academy Award from the American Academy of Arts and Letters. In 2009, he received a fellowship from United States Artists. Hagy Belzberg founded Belzberg Architects in 1997. He is a licensed architect in California, Colorado, Hawaii, and Ontario, Canada. Belzberg has served as a director of the American Institute of Architects in Los Angeles for the past eleven years and has held graduate level instructorships at University of California, Los Angeles; University of Southern California; and SCI-Arc. In 2008, he received the designation of "Emerging Voice" from the Architectural League of New York and was the recipient of the Emerging Talent Award from the American Institute of Architects. In January of 2010, Belzberg was elected to the College of Fellows of the American Institute of Architects for notable contributions to the advancement of the profession of architecture. Monika Häfelfinger and Austin Kelly founded XTEN Architecture in 2000, an award-winning architecture firm based in Los Angeles, California. They have received numerous architectural honors, including several International Architecture Awards from the Chicago Athenaeum/ European Centre for Architecture, the American Architecture Award, AIA California Council Architecture Awards, and the LABC Los Angeles Architecture Award, among others. The work of XTEN Architecture has also been exhibited in the United States and Europe, and published extensively, including appearances in Architectural Digest, Elle Decor, Architectur und Wohnen, the New York Times, the Los Angeles Times, Wallpaper, Architectural Record, Angeleno, and L.A. Architect, among others. Anthony Coscia and Johnathen Day founded Coscia Day Architecture and Design in 1992. The firm, located in Venice, California, has received several awards and has been published widely. 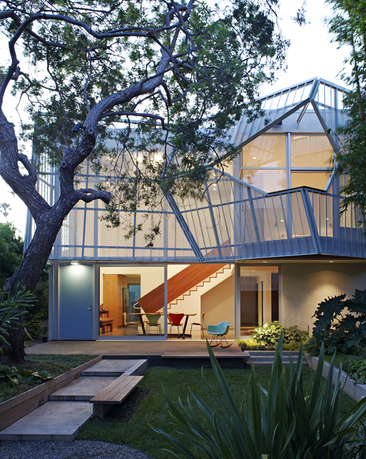 Their Skywave house was selected for Dwell Magazine's Home Tour in 2011, and in 2006, they were included as one of L.A. Architect's “10 Firms to Watch: The Next Generation”. MAKE Architecture was formed as a collaborative architecture and design firm by Jess Mullen-Carey and Bill Beauter in 2000. The practice extends from architecture to furniture, products, and graphic design. MAKE Architecture's work has been published widely, including in the New York Times, Metro, Poplife, the Los Angeles Times, the Washington Post, L.A. Architect, and FORM, among others. Brooks + Scarpa Architects, formerly known as Pugh + Scarpa, was founded in Santa Monica, California in 1991. Angela Brooks and Lawrence Scarpa are principals of the firm. Brooks + Scarpa has received eighteen National American Institute of Architecture Design awards, including the 2010 Architecture Firm Award, four AIA Committee on the Environment "Top Ten Green Project" awards, more than forty state and local American Institute of Architecture awards (including the 2010 AIA California Council Firm of the Year Award), the Rudy Bruner Prize, Record Interiors, and numerous other honors. Their work has been widely published and also displayed in two different exhibitions at the National Building Museum in Washington, D.C., and at the Architecture and Design Museum in Los Angeles. Based in Venice, California, Predock Frane Architects was established by Hadrian Predock and John Frane in 2000. Their firm has received many awards and was included in Form Magazine’s “Five to watch” in 2011. Their work has been published widely, including in the Los Angeles Times, World Interior Design, Architectural Record, California Home+Design, Architectural Review, L.A. Architect, and Wallpaper. Warren Techentin founded Warren Techentin Architecture in 2010. The firm has received several awards, including a Residential Architect Design Merit Award, First Prize Tallinn Architecture Biennale Vision Competition Street2020, and an LA/AIA Design Citation Award. Techentin's work has also been widely published, appearing in Wallpaper, the New York Times, the Architect's Newspaper, Architectural Record, and Metropolis, among others. Sharon Johnston and Mark Lee founded JOHNSTONMARKLEE in Los Angeles in 1998, and have since built a diverse architectural portfolio including residential, commercial, institutional, and exhibition environments with a particular focus on the arts. Their work has been published widely and the firm has garnered many notable awards including Progressive Architecture Design Awards, AIA Los Angeles & AIA California Council Honor Awards, American Architecture Award, and an AR Award for Emerging Architecture. Established in 1998, Touraine Richmond Architects is an architectural firm based in Venice, California. Olivier Touraine is a French architect and has taught in Paris, Los Angeles, New York and currently at University of Southern California in Los Angeles. Deborah Richmond is a California–licensed architect and instructor in Los Angeles, and has taught architectural design and theory at the Art Center of Pasadena and SCI-Arc. Both Touraine and Richmond have been the recipients of design awards and research grants for their respective individual experience and their work has been published in the New York Times, Dwell, Architectural Record, Icon, Architecture, and GA Houses (Japan), among others. Patrick Tighe founded Patrick Tighe Architecture in 2001. Since then, a body of projects has been realized that includes city-developed affordable housing; commercial, mixed-use projects; civic art, installations, and residences. He was awarded the prestigious Mercedes T. Bass Rome Prize in Architecture, the American Institute of Architect's Young Architect Award, and the Forty under Forty Award. Tighe is a fellow of the American Academy and the MacDowell Colony. His firm's work has received numerous awards, including seven National AIA Honor Awards, several American Architecture Awards, a progressive Architecture Award, and several Los Angeles Architecture Awards, among others. In 2011, Tighe was elevated to the College of Fellows of the American Institute of Architects. His work has appeared in A+U, Frame, Architectural Record, Architectural Digest, the Los Angeles Times Magazine, Interior Design, L.A. Architect, FORM, and Newsweek. Greg Lynn founded Greg Lynn FORM in 1995 and is based in Venice, California. He has been a leader in redefining the relationship between design and digital technology and is a professor at University of California, Los Angeles’s School of Architecture and Urban Design. In 2001, Time included Lynn as one of the “100 Most Innovative People in the World” for the twenty-first century. He received the American Academy of Arts and Letters Architecture Award in 2003, and in 2005, Forbes named him one of the ten most influential living architects. Lynn won the Golden Lion at the Eleventh International Venice Biennale of Architecture, and in 2010, he was awarded a fellowship from United States Artists. Herwig Baumgartner and Scott Uriu established B+U in Los Angeles in 2001. Their work was recently exhibited at the Twelfth Architecture Biennale in Venice, Italy; the Architecture and Design Museum (A+D) in Los Angeles; the 2011 AIA Emerging Professional exhibition in Washington D.C.; the Milan Stadtkrone 2030 Exhibition in Milan, Italy; University of Applied Arts in Vienna, Austria; the Audience of Objects exhibition at the SCI-Arc Gallery in Los Angeles; and the CCRD in Hollywood, California. B+U's work has also been widely published in several magazines and websites including Architectural Record, Architects Newspaper, Architect, the Los Angeles Times, Los Angeles Magazine, Angelino, Azure, Futuristic, FORM, and Designboom, among many others. In 2010, B+U published their first monograph, Vectorfields and received the Maxine Frankel Award for design research. Founded by Albert C. Martin Sr. in 1906, AC Martin Partners is a Los Angeles–based architecture, planning, interior architecture and research firm. The firm has been the recipient of several design honors and has been widely published, including in the Los Angeles Business Journal, Architectural Record, and Interior Design. Joseph Giovannini heads Giovannini Associates, a design firm based in New York and Los Angeles. He has taught advanced and graduate studios at Columbia University's Graduate School of Architecture, UCLA's Graduate School of Architecture and Urban Planning, the University of Southern California's School of Architecture, and at the University of Innsbruck. Besides heading his design practice, Mr. Giovannini has written on architecture and design for three decades for such publications as the New York Times, Architectural Record, Art in America, Art Forum and Architecture Magazine. He has also served as the architecture critic for New York Magazine and the Los Angeles Herald Examiner. Published design projects have appeared in Architectural Digest, the Los Angeles Times Magazine, The New York Times, A + U, Domus, House and Garden, GA Houses, Architekur und Wohnen, Sites, and Interior Design. In addition, four full–scale pavilions will be built by the following firms and will afford a glimpse into the near future of California architecture. Benjamin Ball and Gaston Nogues founded Ball-Nogues Studio in 2007, an integrated design and fabrication practice operating in a territory between architecture, art, and industrial design. Ball-Nogues Studio has exhibited in several major institutions, including the Museum of Contemporary Art, Los Angeles; the Museum of Modern Art, New York; the Guggenheim Museum; PS1, New York; the Los Angeles County Museum of Art; and several biennales. They have received numerous honors including three American Institute of Architects Design Awards, United States Artists Target Fellowships, and a grant from the Graham Foundation for Advanced Studies in the Fine Arts. Their work has appeared in a variety of publications including the New York Times, the Los Angeles Times, the Guardian, and Architectural Record, among others. Elena Manferdini founded Atelier Manferdini in 2004. Her firm has been recognized nationally and internationally for its ability to create imaginative architecture and art installations. In addition to her design practice, Manferdini has taught architectural design studios and technology seminars for the graduate and undergraduate programs at SCI-Arc, where is currently Graduate Thesis Coordinator. Founded in 2001 and headed by Principals Marcelo Spina and Georgina Huljich, P-A-T-T-E-R-N-S is a design research architectural practice based in Los Angeles. Their work has been exhibited and published worldwide and is part of the permanent collections of the SF MOMA, Chicago Art Institute and MAK Museum in Vienna. They have been the recipient of numerous professional prizes and awards, including the Emerging Voices Series of the Architectural league of New York, and the Arch is Award by the AIA Los Angeles Chapter. Tom Wiscombe is founder and principal of Tom Wiscombe Design, based in Los Angeles. His work is part of the permanent collection of the FRAC Centre Paris, the Art Institute of Chicago, MoMA San Francisco, and MoMA New York. ICON Magazine, in its May 2009 issue, named Wiscombe one of the “top 20 architects in the world who are making the future and transforming the way we work”. Wiscombe is a senior faculty member at the SCI-Arc and in the Fall of 2012, held the Louis I. Kahn Visiting Assistant Professorship at Yale University. Previously, Wiscombe worked for Coop Himmelb(l)au. Frances Anderton is the host of DnA: Design and Architecture on KCRW, as well as a producer for KCRW's national current affairs shows To The Point, and Which Way, LA? Anderton is also the Los Angeles editor for Dwell and a contributor to the New York Times, among other publications. She is a regular lecturer and moderator at several cultural institutions in Los Angeles. Anderton was raised in the United Kingdom and moved to Los Angeles in 1991, when she was appointed as editor of L.A. Architect. Her work highlighting the Los Angeles-based design and architecture scene has awarded her recognition from the LA/AIA Chapter. Margaret Crawford is a professor of architecture at the College of Environmental Design at University of California, Berkeley, where she teaches courses in the history and theory of architecture, urbanism, and urban history. Her research focuses on the evolution, uses, and meanings of urban space. Crawford has also published several books, including Everyday Urbanism: Expanded, with John Chase and John Kaliski. Ed Dimendberg is a professor of film and media studies, visual studies, and German at University of California, Irvine. He is the author of Film Noir and the Spaces of Modernity, published in 2004. Dimendberg's research interests lie in cinema, architecture, urbanism, modernism, and modernity. Paul Goldberger is a Pulitzer Prize–winning architectural critic and author. He has been the architecture critic at the New Yorker since 1997, where he writes the "Sky Line" column. Goldberger also holds the Joseph Urban Chair in Design and Architecture at the New School in New York and was formerly dean of the Parsons School of Design. John Kaliski, founder of URBAN STUDIO, now John Kaliski Architects, has been practicing architecture for over 20 years. His work has been recognized by the American Institute of Architects (AIA) and the American Planning Association (APA). Kaliski is an author on the topics of architecture and urbanism, with publications including Everyday Urbanism and Everyday Urbanism: Expanded, coauthored with Margaret Crawford and John Chase. Sam Lubell is a freelance journalist, editor, and photographer based in Los Angeles, California. He is editor-in-chief of the California edition of the Architect's Newspaper and has recently written for the New York Times, Los Angeles Magazine, Angeleno, the Architect's Newspaper, Architectural Record, and the Los Angeles Times, among others. His most recent book Julius Shulman Los Angeles: The Birth of a Modern Metropolis was published in 2011. Matilda McQuaid is the deputy curatorial director and head of the textiles department at the Smithsonian's Cooper-Hewitt National Design Museum in New York. Her research specialties are textiles and contemporary design. She has been at Cooper-Hewitt since 2001 and has curated a number of critically acclaimed exhibitions including Josef + Anni Albers: Designs for Living (2004), Extreme Textiles: Designing for High Performance (2005), and National Design Triennial: Design Life Now (2007). Prior to Cooper-Hewitt, McQuaid was at the Museum of Modern Art in New York. Nicholas Olsberg is an architectural historian, curator, and author. He has served as director of the Canadian Centre for Architecture, head of Special Collections at the Getty Research Institute in Los Angeles, archivist of the Commonwealth of Massachusetts, and chief of publications in the South Carolina Department of Archives and History. Olsberg was cocurator of Between Earth and Heaven: The Architecture of John Lautner, which showed in 2008 at the Hammer Museum in Los Angeles. Nicolai Ouroussoff is a noted architectural writer and critic. He was the architecture critic for the New York Times from 2004 to 2011, prior to which he was the architecture critic for the Los Angeles Times. Ouroussoff was a Pulitzer Prize finalist for criticism in 2011, 2006, 2004, and 2003. He is currently working on a book that will look at architects from the past one hundred years. Johanna Vandemoortele is an architectural writer and researcher based in Los Angeles, California. She is currently a curatorial research assistant at the Museum of Contemporary Art, Los Angeles. Prior to moving to Los Angeles, Vandemoortele was a curatorial assistant at the Guggenheim Museum in New York, where she worked on several architecture and urbanism exhibitions and initiatives. In 2010, she coauthored (with Geert Bekaert) Belgium at the Fair: Exile on Main Street. The Museum of Contemporary Art, Los Angeles (MOCA)'s mission is to be the defining museum of contemporary art. MOCA engages artists and audiences through an ambitious program of exhibitions, collection, education, and publication. MOCA identifies and supports the most significant and challenging art of its time, places it in historical context, and links the range of the visual arts to contemporary culture. MOCA provides leadership by actively fostering and presenting new work, emerging media, and original scholarship.